Dubai: More dedicated lanes have been planned across the city for Dubai for cyclists, officials have said. While the Roads and Transport Authority (RTA) hopes to eventually make Dubai a cyclist friendly city by establishing more dedicated lanes, the priority is the integration of Metro stations via dedicated cycling lanes, Nasser Abu Shehab, director of strategic planning, at RTA's Strategy and Corporate Governance Sector, said. "In future, all Metro stations will be integrated with dedicated cycling tracks," he told Gulf News. One of RTA's key strategic goals is to make transport more accessible in the city, which includes introducing bike lanes. At present roads where bicycle tracks are provided include Jumeirah Beach Road and Dhiyafa Road, and work is continuing at Mankhool Road, he said. Meanwhile, several residents complained that workers who cycle on the streets often end up with their bicycles confiscated. "Most of those who get their bicycles confiscated are blue-collar workers. I have seen this happen in areas such as Bur Dubai," said one resident. "Since dedicated tracks are just available at few locations, using bicycles would continue to be impractical until more lanes are completed," said another. RTA has prepared a comprehensive Bicycle Master Plan which covers all areas of Dubai and will be implemented in phases. The implementation will depend on criteria such as - population density, location of activity centres, access to metro and public transport stations, safety requirements etc. "RTA's next phase of the bicycle master plan includes providing bike tracks in areas closer to the Metro Red Line, such as connecting the existing Jumeirah Beach Road to the nearby Red Line Metro stations on the Shaikh Zayed Road," Abu Shehab said. RTA also plans to provide dedicated bike lanes in Bur Dubai. "Biking is safer on low-speed road and roads with bike lanes. Hence biking is not safe near major freeways such as Emirates Road, Al Khail Road and similar high traffic roads and on unpaved areas." But roads with traffic lights, lower speeds and lower traffic volumes are more accessible and safer for bikers, he added. Meanwhile, RTA has recorded a significant drop in fatal accidents involving cyclists, over the past five years. 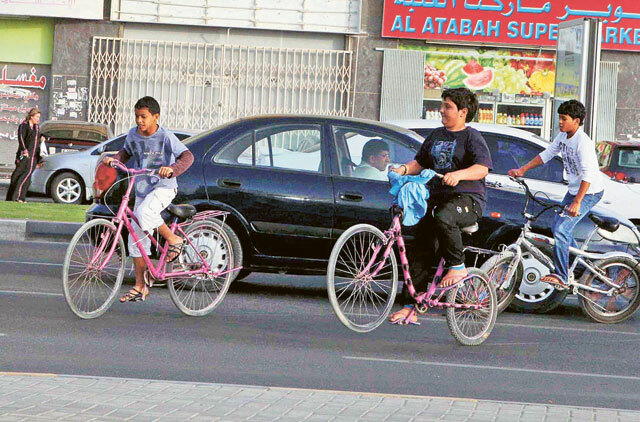 While accidents involving cyclists led to 14 deaths in 2009, this dropped to 12 in 2010 and to six last year, Engineer Hussain Al Banna, director of the traffic and roads agency said. As part of the GCC Traffic Week 2012, RTA held an event yesterday at the Dubai Dry Docks targeting thousands of workers, who use bicycles regularly to travel to and from work. Related events and activities, under the theme "Together to Reduce Traffic Accidents", will continue until March 15. "Cyclists should wear helmets and reflective gear. They should only cross the street from designated areas," Al Banna said, urging them to abide by the rules to avoid accidents, which may result in serious injuries and even death. A team of RTA's traffic awareness department staff delivered lectures to the workers, explaining some of the causes of collisions and how to avoid them. The key points in the Federal Traffic Law were highlighted, alongside traffic safety guidelines.